These mountains wouldn’t be what they are without the numerous species of trees covering these hills. 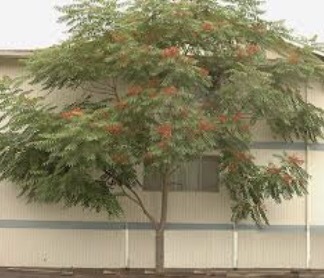 Most are native, while others, like the Tree-of-heaven (Ailanthus altissima) and the Mimosa (Albizia julibrissin) emigrated with people, either from outland or across seas. The Appalachian mountains are one of the great gatherings of flora and fauna on earth, and as such, they are a mainstay of Appalachian folk magic. 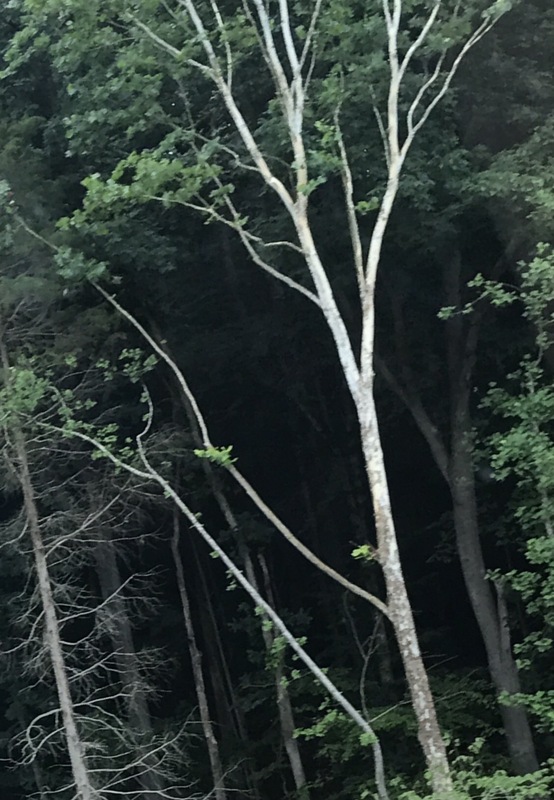 In the Appalachias, trees are respected and looked upon with wonder. Well, they once were before the urbanization and mountain-top strip mining started. Folks use to know what it took to build their houses and boats, what it took to give warmth in the winter. Our relationship with trees, and nature in general, is almost non-existent amongst the electric heaters and lights, barred from the torrents of winter storms and summer’s tantrums. Now the only admiration they get is from the northerners and those who only stop and look at a calendar picture. But they are integral to our work and life. The grannies knew this. They knew the medicines and magic of the giants that surround and shade us. In Appalachian Hoodoo, all parts of the trees are used: leaves, bark, flowers, branches and roots. And if it’s provided, the sap as well. It’s mostly the bark and branches though, with the occasional use of the root if your patient enough to wait and get it. There’s an old technique of harvesting from the Cherokee that most of us still use today. Remember, each family is taught and does different. What I show here is a variation of what I do. Can’t show all my secrets now. Whether herb, bush or tree, we always harvest from the 4th or 7th plant of the species. This way there will be enough left for 7 generations to come. Now the actual process differs among Mountain workers. Some make sure that their back is facing the wind so as not to “scare the spirits”. That one I never really figured out. Others will talk with the spirit of the plant first and ask permission (which I highly recommend! Don’t be a jerk). Now, it’s best to go early in the day before daylight or at dawn, during the waxing or full moon to harvest leaves or twigs. If it’s an up ground plant, you harvest during the growing of the moon. If it’s an underground crop or you’re harvesting roots, do so in the waning or the dark of the moon. The reason being: the moon pulls on moisture. When the moon is growing or full, the plants essential qualities will be drawn up the plant into the leaves and stems. Beneath a waning or dark moon, the majority of this recedes back down to the roots and bark. You don’t want to harvest leaves or such when the sun is shinning and it’s hot cause this can put the plant in shock. Another thing, if you’re harvesting for medicine, the best time is waxing/full moon, before sunrise. Because when the sun rises most of these oils recede into the stem so as not to fry the leaves by the light magnifying inside the leaves. You get the point. Upground or leaves/twigs = waxing moon/warm season; roots and bark = waning moon/cold season. Now when you’re asking permission, ask out loud and tell the spirit what you need it for. You will get the feeing of “yes” or “no” following. If the plant says no, either pass 4 or 7 more plants and try asking another one; or wait another day. If they say no, give your offering to thank them anyway for the medicine they carry. When you do harvest from a willing plant ONLY TAKE WHAT YOU NEED. So many plants are on the brink of extinction due to the greedy paws of man. Ginseng and Goldenseal are just a couple among many. Due to others desire for them and my distrust for people, the places I harvest from are my secrets and will go with me to my grave. It’s not fair to the plants. The Cherokee have a story about this. When man forgot to thank the live he took to survive, when he kept taking more than he needed, the animals met in council led by Bear. They determined man is ignorant and deserves punishment. So they cursed man with many diseases. But the Standing ones (plants) felt compassion for this bald monkey tumbling around the forest. They said “he may trample on us and take more than we offer, but he’s the youngest of us and just needs to learn. So for every disease you animals give them, we will offer a cure for everyone.” Recent scientific studies are showing that the Standing Ones have kept their promise. It’s very benefiting to build a relationship with the trees on your own land. Doing so will befriend them and they may even offer to help protect your property and yourself from those who wish harm and things that go bump in the night. Spend time with them and bring gifts for them as well as the Good Folk. Possible offerings differ from plant species. Bearded iris’ seem to enjoy milk, water, and bread crumbs; Oak enjoys a good shot of rum with some tobacco, and the occasional gifts of silver change; Willow loves seeds, honey and cold water. As practice a give and take with the land. Man is the only animal who no longer honors this unspoken law. A lot has changed since the times of the Cherokee and Chickasaw, but we still hold true to one thing: plant, animal, people or mountain, this is a family. Family doesn’t use, it gives and takes and gives again, continuously. While this may only hold fast with half the folks here now, it still grows in the heart of this land, nourished by the soil our Ancestors layed their bones in. So now that you’re a bit prepared for dealing with these Spiritual giants, here is a list of trees worked with in these mountains. Oak is the strong grandfather, standing tallest in these hills. The champion oak (Quercus rubra) can grow to an exceptional height of 140+ feet. The people of the Irish Moors saw the oak as sacred and powerful. Grandfather oak lends his power for protection, strength and healing. This is why the twig charm (see We Hold Our Own) uses oak twigs with your hair and red string, to protect. Willow is the beloved sweetheart of every southern hick. Her fronds brush against Mother Earth and “sweeps the footprints of those recently dead.” Growing up, I was told allot of lore surrounding the Weeping Willow. All the trees branches reach up toward the Creator to give thanks for the rain and for life. While the Willow is always overcome with gratitude that her branches droop and she cries. This makes her the purest Sitting Soul in these mountains, which explains why she is used for healing (medicinally and magically), for love works and bindings. If there’s any tree that embodies Mother Appalachias spirit more, it’s the Willow. Walnut is like the grumpy old man people are best not to mess with unless they need him real bad. He’s wise and doesn’t sugar coat things. He also embodies a sense of justice, “eye for an eye”. For this reason, we use walnut for wisdom, court case work and crossing up someone who did you wrong. Now when you cross with walnut, make sure it’s justified or it won’t help you. It works somewhat like High John, make sure your on the side of justice. Tree-of-heaven is used for cleansing, protection, and removing blockages (flowers). The roots are harvested in the fall and carried to bring the blessings of heaven. Maple is the sweet gal who can break a bone when she needs to. She lends her assistance primarily through her leaves (which, depending on the species, can grow bigger than your head). The twigs and bark are sometimes paired with Yellow Dock Root when making love dollies. The leaves are added to incense, oils and sachets to draw love and sweeten situations up. The sap is gathered on the full moon to act as a resin for love drawing incense. It also packs a punch when gathered on Beltane if you can find it. Apple is the go-to for love and protection. Her reputation has traveled continents and time, mostly stemming from European witchcraft. For offerings, she loves a cold glass of milk sweetened with honey. The leaves, bark, flowers and fruit are used. For protection, cut an apple in half to reveal the pentagram formed by the seeds. Take a bay leaf that has soaked in whiskey for a moon and place it ever the seeds and pin it. This Old World trick is to protect against haints and to keep people from throwing at you. For love works, bore the stem out of the apple, and load it with cinnamon, Willow leaves, Queen Anns blooms. You can also add your sexual fluids to this. Stop the hole up with a white, pink or red taper candle. If need be, cut off the bottom of the apple so it sits firmly. Magnolia is that large woman who loves to cook for her family and anyone else with a growling tummy. She is chief (chieftess? I think it’s gender neutral) among trees when it comes to the heart and home. The leaves, bark and flowers are used for matrimony, to incite fidelity, and to keep a marriage happy. The flowers smell amazing, but fair warning, they smell aweful when the flower starts to die. Crepe Myrtle is a non-native, short tree (or bush, depends on who you ask) that has been embraced by the mountain traditions. The peeled bark and flowers are used to incite passion and lust. But Myrtle is a feisty gal who’s always after someone else. As it can be imagined, Crepe Myrtle is used to attract sexual lovers and it’s well put to use in a love working. Her fire burns out as quickly as it’s lit. Birch (especially Paper Birch) is used for a safe pregnancy and delivery. She stands tall and proud in her unique bark among these hills. Her energy is strongly connected to the Irish Brigit, so it’s leaves and bark are used for healing, creative inspiration, and to smooth out situations. Poplar is one of the youngins of the forest. He’s particularly good in dispelling nightmares, money works, and to gain the attention of others; in particular to create a glamour for others to see. He’s a simple one, enjoying a cold glass of water on his roots and an offering of tobacco. Mimosa is used for spirit communication, healing and protection. The root is carried to protect from haints and accidents. Paired with yarrow, mimosa flowers are soaked in water while sitting in the sun (even better if it’s raining while the sun is shining) to make a healing wash that’ll take off worts, clot blood, and settle cramps. Pine is a watchful grandfather who provides what is needed. He lends his needle leaves for money, healing, cleansing and protection. In Cherokee mythology, Pine is one among many who did not sleep during the days of creation, so the Creator bestowed immortality upon him. Pine holds a sacred medicine. A medicine that holds hands with Endless time and the spiral of life and death. It’s said that if a pine tree, or any evergreen tree dies suddenly, then there has been evil worked there or evil has touched the ground. Holly is another evergreen here. His thorny leaves are used for protection and his berries carried for fertility and love. If for love, the berries will ensure a long lasting bond. Another tree sacred to the Celts, Holly symbolizes hope and life everlasting. The berries can also be pulverized and dried to be added to an oil or salve to assist in speaking with the Good Neighbors. Mountain Laurel is a lonely old man, only to be found high in the mountains usually. He lends his wisdom through his leaves, which are carried for protection and victory. If anybody is trying to mess with you or trip you up, the leaves create a wall for them. Laurel is one tree that is the most inhabited by the Good Folk so be sure to bring them an offering of corn, cream and tobacco. Redbud is the littlest sister in these hills, being the first to perk up her dark pink blooms in February. She’s an attention seeker and always wants to be the first to be noticed. Because how can you miss pink flowers among a forest of brown, dead bark. For this reason, her blooms (only the blooms) are harvested each year to be added to works that are done to get another’s attention, such as Come to Me Boy. The leaves and bark are rarely, if ever used. PawPaw ain’t got a mean root at all. The strips of bark are bound to the feet of the ill and rubbed each night of the full moon for healing to happen. The fruit not only taste delicious, but also makes a good “bed” to put the locks of hair belonging to the ill paired with a tree-of-heaven root; this is said to act as a petition for heavens help. You bind the two halves of the fruit, with the hair and roots inside, together and place in under their bed. As the fruit rots so will the decease or sickness until it is gone. So now you have a good idea of how we work with these Giants of the Hills, I’ll leave the rest to you. I may do another post on this soon. Not sure yet. Y’all be good to one another. Reblogged this on Haint-Blue Shudders.